CANINE HEALTH RESEARCH FRAUD? FREE SPAY-NEUTER = ABORTION CLINIC? Does Free Spay-Neuter = Abortion Clinics? Blood and DNA samples collected at dog shows are SOLD to laboratories so do free spay-neuter clinics and abortion services sell organ or fetal tissues? A friend of mine let her dog be part of a cancer research study when the veterinarian told her it had a rare tumor that could help save other dogs. As it turned out, the study was for human melanoma research but the vet convinced her that she and her brave dog could save countless lives by letting them take "plugs" from his tumor. I'll spare you details on the agony that poor dog went through from being constantly used for tissue samples and from being kept alive long after my friend would have mercifully let him go. Watching him suffer and her being told that too much pain-killers would interfere with the test results and "other therapies" they provided was more than I could bear. She lost her dog and I lost a friend. She meant well but I have learned how gullible we pet owners are. I had a flashback to that poor dog when I watched, horrified, a TV show on Planned Parenthood. They showed doctors (I would call them vampires!) harvesting organs from aborted babies when the "fetus" was alive! That made me wonder what happens when a pregnant dog or cat is spayed? Does the vet freeze the unborn puppies or kittens and sell their body parts to a laboratory? Is that the newest twist on "spay and neuter clinics"? Are they really just canine abortion clinics that harvest and sell body parts? I'm not good at searching online but my daughter is and she immediately found dozens of companies that use or sell "fetal tissues" for research and hang on, for cosmetics! I once used Mary Kay Cosmetics and I was shocked when Jean sent me links that touted "collagen" in their products. So where does collagen come from? My first guess, based on some vague memory, was that it came from chickens but no, for human use, it comes from human babies. It actually says "placental and fetal material." Just google "101 uses, fetal tissue, Olga Fairfax, Ph.D" and you will wonder why it took so long for television coverage to reveal the gruesome market in harvested baby parts. Reading all that actually made me sick. I made some ginger tea (great for nausea) and sat back down at the computer. The next link I opened (animal technologies.com) touted itself as a "major supplier of raw animal sera, blood products, tissues, glands and organs." I went back for another cup of tea. Fortified, I opened more links and learned that blood is especially valuable, not for transfusions but for the DNA it contains. 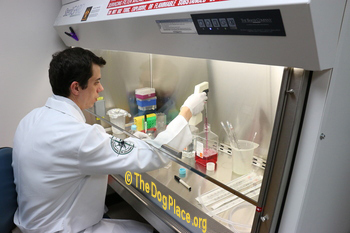 There were dozens of requests for canine DNA, all from what sounds like veterinary universities. I'm not good at this internet stuff so maybe I missed something. Like a cure!!! 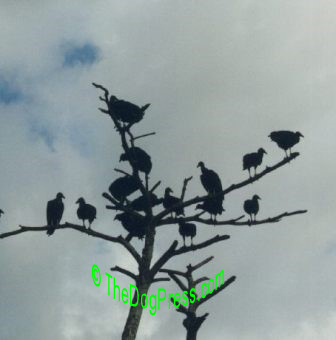 I called the editor and she said the vultures flock to national specialties to collect blood and DNA. She told me they take blood right from the jugular vein! I'm getting better with search engines and she gave me some "keywords" to help me look. 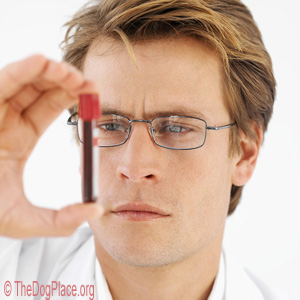 It took only a few minutes to winnow it down to the best results for "canine health studies, blood, tissues". 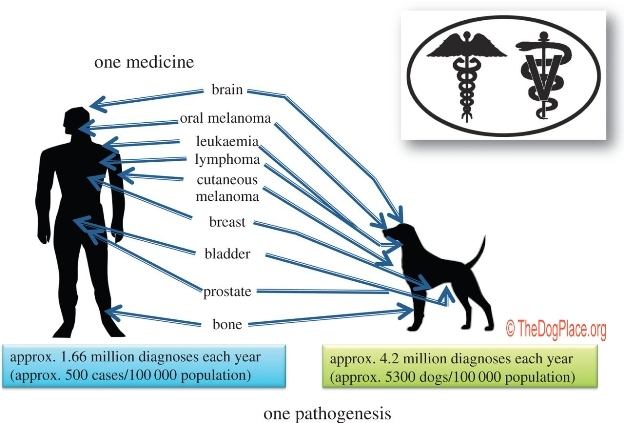 It seems dog breed club members give blood for DNA studies to cure cancer or health problems they say are connected to that breed. BJ suggested that I ask you, "you" now numbering nearly a million and a half people, to help us help each other. As human beings, we live on hope and because so many of us or our pets are afflicted with cancer, we would do anything for a cure for cancer. I am an optimist but as my husband used to say, I'm not a fool. Here are some of the articles I found that expose health research scams. Mrs. Andrews said I should specify that we eliminated what she calls off-site links because they can change (get broken) and that causes us to get penalized in the search engine rankings whatever that means. What I had already found was that all the things I opened because they promised a "cure for cancer" were just big time frauds!!! Not one single site other than a couple of "alternative medicine" and herbal medicine websites actually offered any kind of real help for cancer. I plan to look into those sites later. So if your pet, especially cats that are harder for people to read, is diagnosed with the "Big C" don't panic and don't let it be cruelly used "for research." And we all want to support animal health research but I don't think any of us what to be duped at the expense of our pets. This stuff about selling blood and fetal tissues would be in what they call "mainstream media" except it is the drug companies that support that media. Death rates continue to climb, researchers fail to disseminate information.